We’ve seen T-Mobile update several Samsung smartphones lately, including the Galaxy S8 and S8+, Galaxy S7 and S7 edge, and Galaxy Note 8. Now it’s the Galaxy S10 series’ turn to be updated. These updates are now rolling out over the air, and TmoNews readers Javin, Mr P, and Aaron all received their updates this morning. If you haven’t yet updated, you can either wait for the OTA update to come to your phone over the coming days or you can manually check for your update by going into Settings > Software update > Download updates manually. 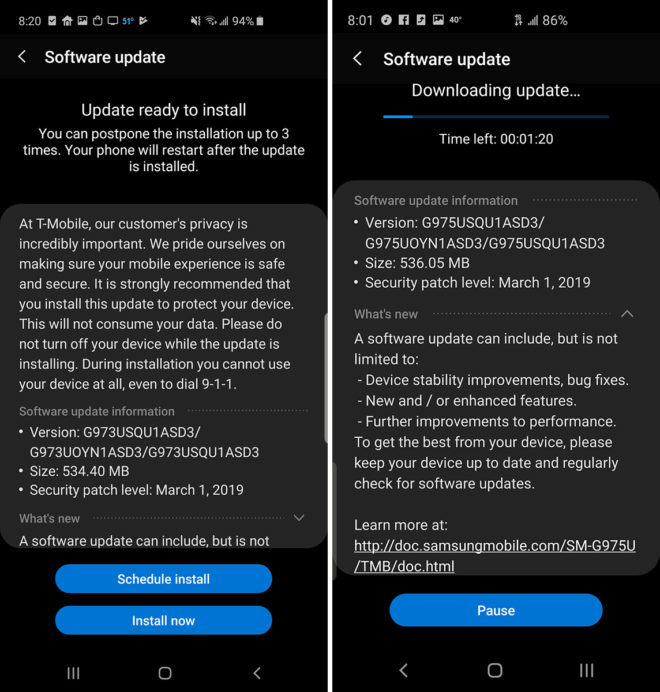 The Galaxy S10’s update is version G973USQU1ASD3, the Galaxy S10+’s update is version G975USQU1ASD3, and you Galaxy S10e owners are getting version G970USQU1ASD3. Once you’ve updated your Galaxy S10, S10+, or S10e, let us know how the update feels! Thanks, Javin, Mr P, and Aaron! Got the update and then only noticeable feature is they added is the heart rate sensor led is now a indicator for the wireless power share. I heard they were supposed to be adding 25 watt charging but haven’t confirmed it working yet. Did anyone else’s Smart Lock disappear? 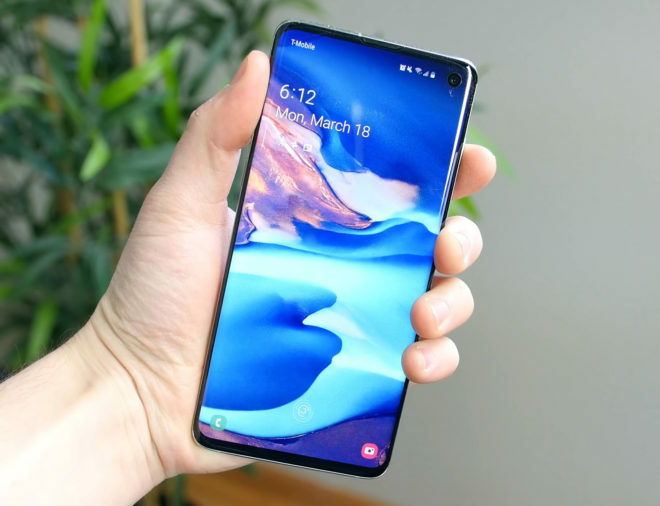 Has anyone had any trouble unlocking their S10? I have been back and forth with support for over a week and they can’t figure it out. Yea, sometimes. I’m getting sick of it. They need to fix it. I have the issue from time to time and noticed that it happens when I lock it or the screen times out and I immediately try to double-tap to wake or press the power button to wake. Often the phone does not respond at all to my commands. Oh, also the always on clock disappears when this happens too. These frustrating incidents are only for a few seconds at a time, however. I didn’t plug in my phone overnight, and battery drain is like what you see with iPhones, just 2% lost while sleeping. Note that I have Always on Display set to show up when you touch the screen. I’ll change the settings just to see how much power loss there is with AoD set to show at all times. I’ve had it charge only 2 percent in 3 hours. I unplugged it and plugged it back in the it charged right up. This is an issue as it has happened more than once. Also standby drain is ridiculous. I get better battery performance while using the phone… Hope it’s fixed soon or back to pixel I go. I woke up this morning to see the same update for my unlocked S10. The fingerprint scanner is definitely quicker.